The following video shows that small LED with a maximum supply voltage of about 3 vdc, it is supplied with a high voltage of 220 vac with a very simple circuit without transformer. One 1N4007 diode is used as a rectifier. One 330 kiloohms resistor is used as current limiter. 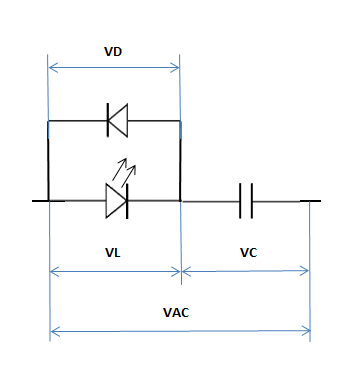 The following schematic has circuit components which are connected in series. CAUTION: all parts of the circuits contained in this article are connected to high voltage, either directly or indirectly. Do not touch circuit while being connected to the high voltage. Use equipment that are well insulated. When current is flowing in 1N4007 diode, it will be a voltage of 0.6 volts (VD) between the anode and the cathode pins. Diode is additional safety because LED cannot stand high reverse voltage. Usually the maximum allowable reverse voltage is only 5 volts, if more than that will immediately damage the LED. If the LED used is of good quality, then this diode can be removed. Shown in the video, LED is blinking at a frequency of 50-60 hertz. This happens because the diode and LED only allows half wave of alternating electric current. If you want to reduce LED blinking, you need to install a capacitor to stabilize the current, and use a diode bridge as a full wave rectifier. Resistance = resistor voltage / resistor current = 216.4 volts / 30 mA = 216.4 volts : (30 / 1000) amperes = 7,213.33 ohms. The above resistor value is the smallest value for maximum LED brightness, if the resistance is reduced then LED could be broken because over voltage. In the video, the resistor has much higher value for safety, and to avoid LED light blinds the camera. With 330 kiloohms resistor, white LED is still very bright. If LED brightness is too low, the value of resistor can be reduced from 330 kiloohms carefully. Since the current is intermittent or half-wave current, the actual power of the resistor is half of the power above, ie 0.07 watts. So, resistors with 1/4 or 1/2 watts power are widely available in the market, those resistors can be used safely. Note that LED tends to keep the voltage values ​​at the anode and cathode remains stable. So the internal resistance of the LED will change according to the current through it. The bigger the current, the lower the internal resistance of the LED. The smaller the current, the higher the internal resistance of the LED. 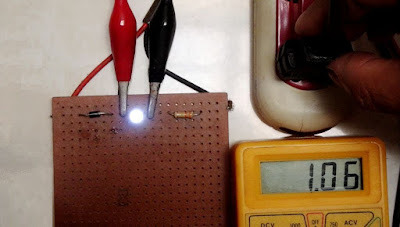 The actual value of the resistance and the voltage of the LED in the test in the video are higher from the value above, because only half the wave of alternating voltage is used to turn on the LED. Theoretically, if there are many LEDs connected in series, then resistor is no longer needed to limit current. Example calculation: it is known LED with a maximum voltage of 3 volts DC, for 220 volt supply voltage will need LED as much as 220/3 = 73.3 pieces, which are connected in series. Of course that amount is the minimum amount, for safety reason then it should be more LEDs that are connected in series. And the rectifier diode is still needed for safety, only one (1x) piece. The following schematic describes the circuit with a diode connected in parallel with the LED. In the above circuit, the LED will light up when the current flows from left to right. LED will be off when current flows from right to left through diode, not through LED. The disadvantage of this circuit is that there is a power consumption when current flows from right to left, although the LED is not on. The VL voltage will only occur when the LED is on. And the VD voltage will only occur when the LED is off. Since the current is alternating current, it will be difficult to measure the LED voltage (VL) accurately. The voltage on the resistor (VR) is alternating voltage. Or it can be rounded up to 10 nanofarads. But the problem is that this capacitor must be withstand to high voltage, reaching at least 250 volts. And this capacitor must also be of the type of capacitor for alternating current (AC), which is usually more expensive than direct current (DC) capacitors. Theoretically the capacitor in this circuit will not generate heat. Because the capacitor discharges the electrical energy it holds, not in the form of heat energy. So there is no need for power calculations. But in practice the dielectric material inside the capacitor can generate heat, as the effect of the voltage changes. This often happens at high frequencies. Then we need a capacitor with a good dielectric, and of course the price is more expensive. If the LED light is not bright enough, then the capacitor value is raised carefully. The nature of the capacitor with the alternating current is the inverse of the resistor. On the resistor, the higher the value the greater the resistant. In the capacitor, the higher the value the smaller the resistance to the alternating current, as can be calculated on the above reactance formula. Video of testing LED with capacitor to connect to 220 VAC. Sometimes LED is very sensitive and can not withstand reverse voltage. For that reason we need to add a rectifier diode, as the following scheme. Seen in the above circuit, a rectifier diode is added in series to LED. So the LED is completely shielded from reverse voltage. Due to the above considerations, of all suggested circuits, the topmost circuit is the best and recorded in video. 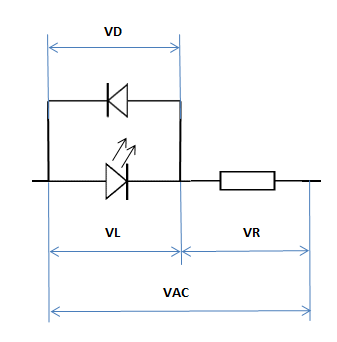 This circuit also can be applied to 110 volts AC with certain modification. This circuit can be applied as an LED meter, LED tester, LED indicator, and others. Watch also video about LEDs in series for 9 volts, 12 volts, and 220 volts. More detail about LEDs in series connection. Good ideas...and good abbreviation. Thank you.